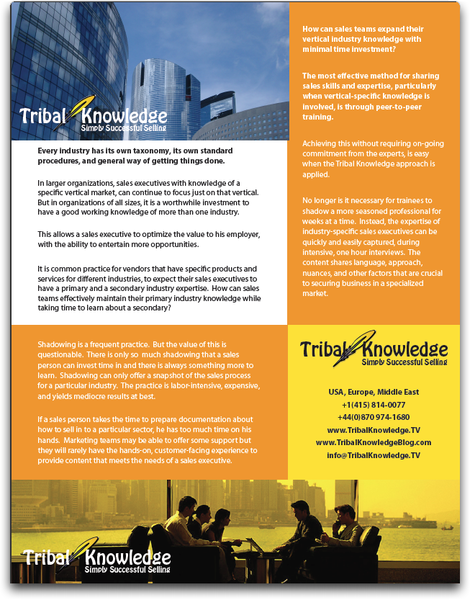 Lead the company through several strategic evolutions in line with commercial demand in the high-tech industry. 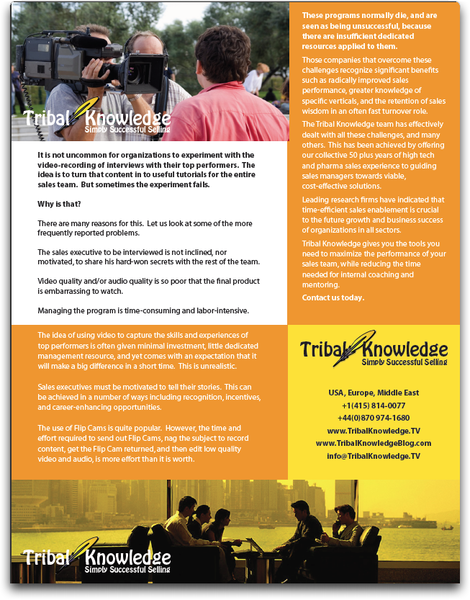 Positioning and sales of Tribal Knowledge products and services. 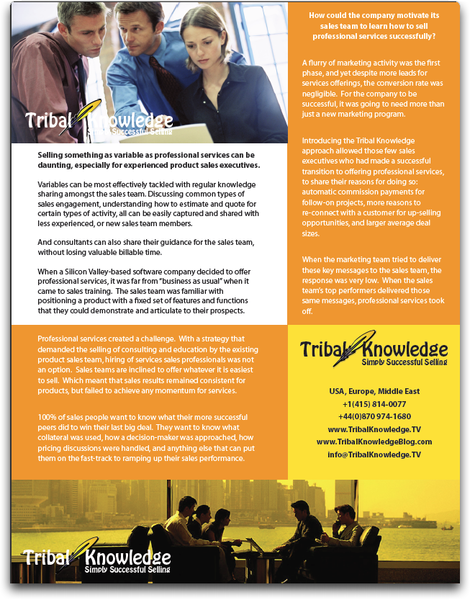 Tribal Knowledge time-efficiently and cost-effectively captured the skills and expertise of top performing sales teams, marketing resources, and executives, transformed that content in to bite-sized nuggets of wisdom and essential information, and made that available to entire sales and customer support teams via convenient and existing technologies. 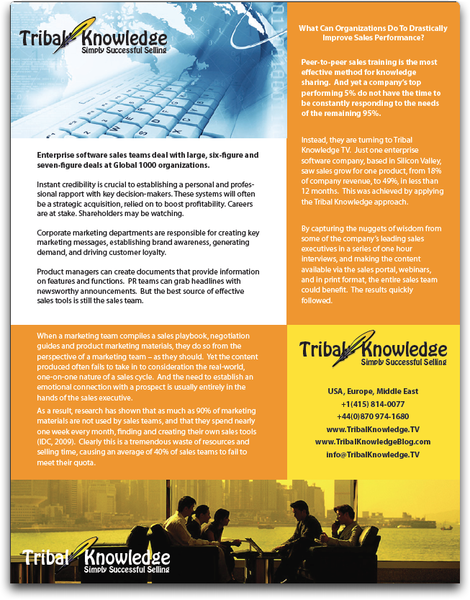 Hands-on execution of sales training and marketing strategies including all inbound, analysis, and outbound activities, as well as development and delivery of training materials in classroom, via GoToMeeting, and at customer locations. Seven years of experience in evolving internet-based technologies for sales support and marketing programs including blog development, social networking, and podcasting. Team management responsibility for up to thirty, based locally and remotely, including hiring, evaluation, and termination as required. Results included taking a small business from a $3m loss to a $10m profit in 18 months based on a revised corporate sales and marketing strategy. Other results included growing on-line sales from 23% of overall sales revenue, to 51% in 12 months. Blue chip clientele, mostly based in the Silicon Valley region. Direct support of C-level sales cycles, travelling throughout the USA and Europe, to close large product and consulting deals for Global 1000 organizations. Development and delivery of international sales training and sales support systems in classroom, via the corporate intranet, and scheduled virtual meetings. Develop and execute global marketing strategy for professional services/solutions in support of enterprise software sales of Business Objects, a business intelligence application. Development and launch of an on-going global branding initiative. 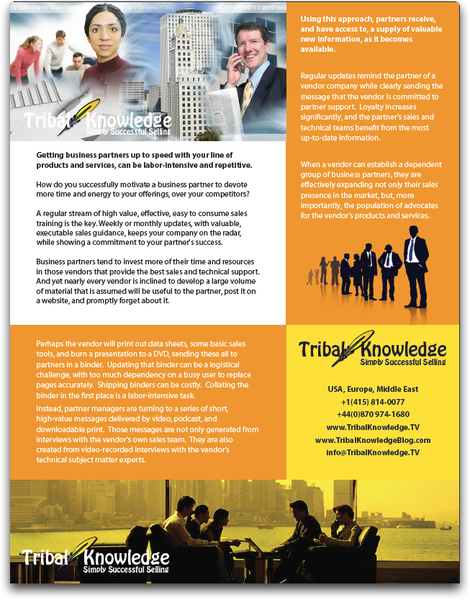 C-level Business development for IBM’s new Knowledge Management consulting group, a sub-set of IBM Global Services, for Fortune 100. Responsible for development and direct delivery of marketing and sales training materials and field sales tools for US and European resources. 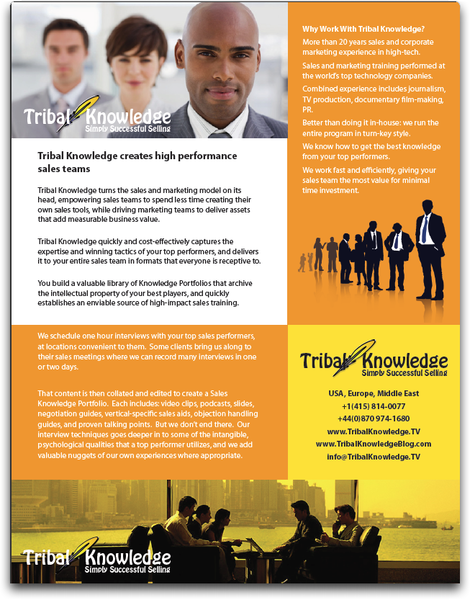 Certified in, and trainer for the Solutions Selling™ sales methodology. Responsible for developing new professional services opportunities with revenue to the value of approximately $5 million. Located in Europe and in Johannesburg, South Africa from 1996 - 1998. Established and managed a new pan-Euro-Africa marketing strategy for Lotus Consulting Services and associated solutions. Responsible for the training of international marketing and sales teams and business partners including the application of the Solutions Selling sales methodology. 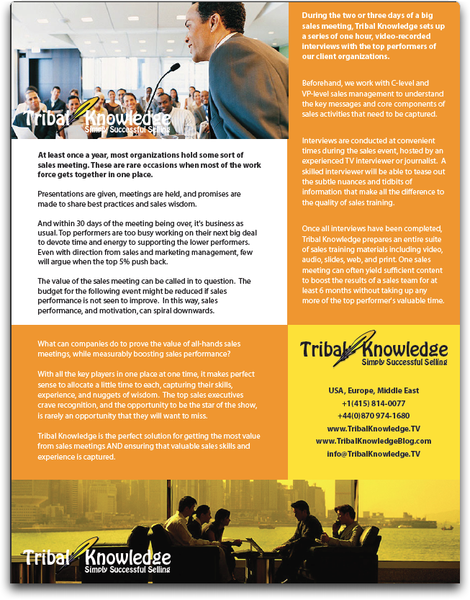 Established inbound and outbound processes to standardize Lotus Notes solution roll-out in Europe and South Africa. In the USA, sold at C-level in to American Express, Disney, Peoplesoft, Airtouch Communications, Sony Entertainment, Hewlett Packard, and Capital Group. Account management resulted in an increase in follow-on sales of professional services engagements from $30,000 to $1.6 million in 18 months. Some of this time with IBM was as a contractor with a business partner. With more than twenty years of international experience working with Global 100 organizations, co-founder Michael Fox has a unique perspective on the role that sales and marketing plays together.During his time working for IBM's Knowledge Management team, and Business Objects, Michael realized that the best source of sales training was other sales people. His efforts to apply this at a Silicon Valley enterprise software company was directly influential in growing professional services revenue by 49% in less than 18 months. Michael has trained in, and applied Solution Selling, SPIN Selling, the Complex Sale, and Miller Heiman account management methodologies, Michael has an all-round perspective of the strengths and weaknesses of each.With more than fifteen years in strategic corporate marketing roles, mostly for Silicon Valley-based companies, Michael has the rare blend of experience that can significantly improve sales performance.